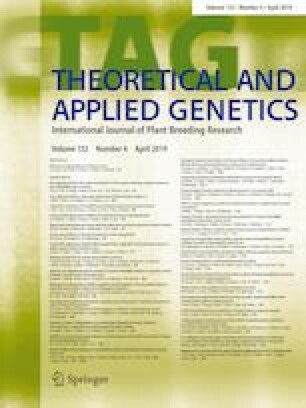 A new powdery mildew resistance gene conferring a wide spectrum of resistance to Bgt isolates in the USA, Pm63 , was identified in Iranian wheat landrace PI 628024 and mapped to the terminal region of the long arm of chromosome 2B. Powdery mildew is a globally important wheat disease causing severe yield losses, and host resistance is the preferred strategy for managing this disease. The objective of this study was to characterize a powdery mildew resistance gene in Iranian landrace PI 628024, which exhibited a wide spectrum of resistance to representative Blumeria graminis f. sp. tritici (Bgt) isolates collected from different regions of the USA. An F2 population and F2:3 lines derived from the cross PI 628024 × CItr 11349 were used in this study, and genetic analysis indicated that a single dominant gene, designated Pm63, conferred resistance to Bgt isolate OKS(14)-B-3-1. Linkage analysis located Pm63 to an interval of about 13.1 Mb on the long arm of chromosome 2B, spanning 710.3–723.4 Mb in the Chinese Spring reference sequence. Bin mapping assigned Pm63 to the terminal bin 2BL6-0.89-1.0, 1.1 cM proximal to STS marker Xbcd135-2 and 0.6 cM distal to SSR marker Xstars419. Allelism tests indicated that Pm63 is a new powdery mildew resistance gene, which differs from other genes in the terminal bin by origin, genomic location, and responses to a set of 16 representative US Bgt isolates. Pm63 can be widely used to enhance powdery mildew resistance in the Great Plains, western, and southeastern regions of the USA. Chengcheng Tan and Genqiao Li have contributed equally to this work. We thank M. Hargrove and R. Whetten for excellent technical assistance and Dr. Robert McIntosh for critical reviewing the manuscript. Mention of trade names or commercial products in this publication is solely for the purpose of providing specific information and does not imply recommendation or endorsement by the USDA. The USDA is an equal opportunity provider and employer.